Short on shelf space? L.A. cocktail experts David and Lesley Solmonson believe a great home bar is an abridged one. 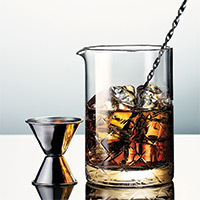 Their new book, The 12 Bottle Bar, offers tips on stocking enough liquor to keep your cocktail list large but your investment small. Step 1: Hold spoon with one hand like chopsticks. Anchor bottom of glass with other hand; don’t grasp it—that heats the liquid. Step 2: Use back of spoon to stir, maintaining contact with inside of glass. It’s a finger flick. You’re not so much stirring the ice as tickling the glass. 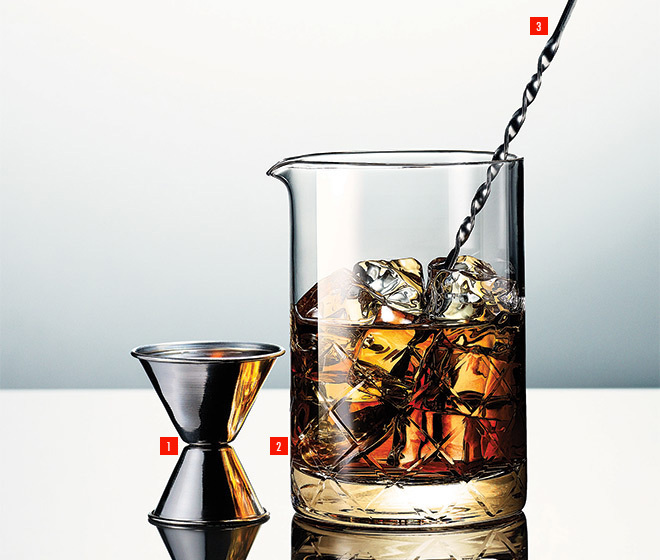 Step 3: As you stir, watch for liquid level to reach top of ice—about 40 to 60 revolutions. That means it’s properly diluted. Strain and enjoy.